A new study reveals that distinct networks of genes in the honey bee brain contribute to specific behaviors, such as foraging or aggression, researchers report. The study, in the Proceedings of the National Academy of Sciences, is the first to show that common, naturally occurring behaviors are under the influence of discrete regulatory networks in the brain. It confirms, scientists say, what years of research into the brain and behavior seemed to indicate: There is a close relationship between changes in gene expression  which genes are actively transcribed into other molecules to perform specific tasks in the cell  and behavior. "We found that there is a high degree of modularity in the regulation of genes and behavior, with distinct behavioral states represented by distinct gene network configurations," said University of Illinois entomology and neuroscience professor Gene Robinson, who led the study. Robinson is the director of the Institute for Genomic Biology at Illinois. The study made use of data from the BeeSpace Project. Curated by Illinois medical information science professor Bruce Schatz, BeeSpace is a catalog of genes that turn on or off in the bee brain in response to social cues, environmental changes or as a result of hereditary factors. By analyzing gene expression and behavioral data from dozens of studies (which were performed under the auspices of the BeeSpace Project), the researchers were able to get a broad view of the molecular changes in the bee brain that contribute to behavior. 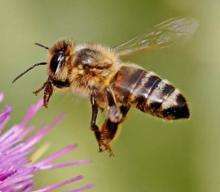 The team focused their analysis on lists of genes implicated in at least one of three categories of behavior: foraging, such as scouting for flowers or navigating to and from the hive; maturation, the process by which an adult honey bee graduates from being a nanny to working as a forager as it grows older; and aggression, or hive defense. The researchers then used a systems approach, led by Illinois chemical and biomolecular engineering professor Nathan Price (now at the Institute for Systems Biology in Seattle), to create a computer model of a gene regulatory network that could predict the differences in gene expression seen in the experimental studies. The model found a "mosaic" pattern of behavior-related gene expression in the brain. It also predicted that a few transcription factors  genes that regulate other genes  play a role in all three behavioral categories. Only four of these "global regulators" were identified, while sets of about 15-25 transcription factors were behavior-specific. Researchers have long worried that the regulation of brain gene expression is too complex to fathom, because so many factors can act together to regulate behavior. "But now we see that direct, linear relationships between transcription factors and downstream genes can predict a surprisingly large amount of gene expression," Price said. "This gives scientists hope that it will be possible to completely understand the regulation of brain gene expression in the future." More information: "Behavior-Specific Changes in Transcriptional Modules Lead to Distinct and Predictable Neurogenomic States," Proceedings of the National Academy of Sciences (2011).